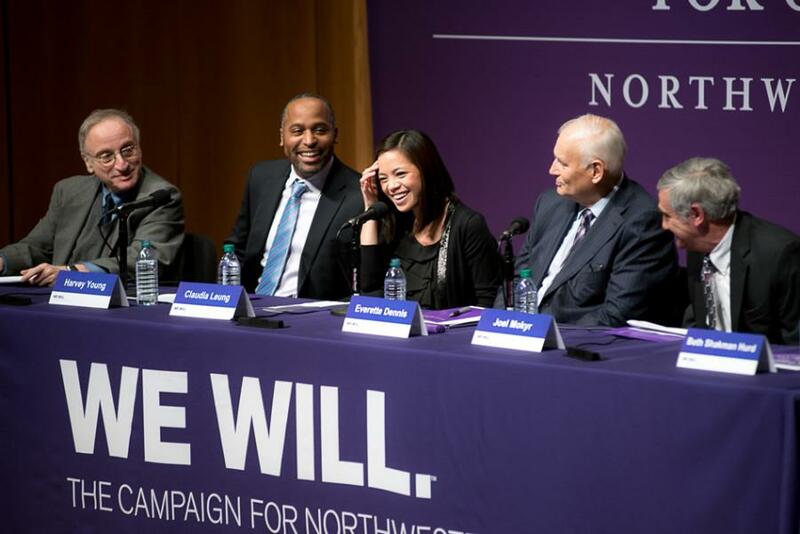 A panel discusses a new Northwestern global studies initiative on Jan. 28 after the University announced Roberta Buffett Elliott’s (Weinberg ‘54) record $100 million donation to the “We Will” campaign. NU officials have confirmed that the campaign is ahead of schedule. Top University officials have confirmed Northwestern’s “We Will” campaign is ahead of schedule. “Either we’ll finish the campaign early or we’ll raise more than what we have set a goal for,” said Bob McQuinn, vice president of alumni relations and development, in an interview with The Daily last week. The confirmation comes after alumna Roberta Buffett Elliott’s record $100 million donation late last month. Elliott’s donation, announced Jan. 28, put the total raised for the $3.75 billion campaign above a landmark $2 billion both pledged and donated. Meanwhile, the University is netting donations at a rate of more than $8.8 million a week, McQuinn said. The campaign, which McQuinn said was expected to run for about seven years, has a goal of recruiting 141,000 donors. As of last week, NU was about 1,000 donors shy of 100,000, McQuinn said. According to him, about 60 percent of donors are individuals — mostly alumni and parents — as opposed to organizations and foundations. Roughly two-thirds of the money donors have pledged has already been received by the University and put to use, McQuinn said. About 45 percent of the money goes toward the NU endowment, and about 15 percent is funding buildings and facilities around campus. The rest goes to current expenditures. We Will donations are funding major construction projects around campus, including the Music and Communication Building, the Kellogg Global Hub — a new lakeside building which will house the Kellogg School of Management and Weinberg’s economics department, the planned Lakefront Athletics and Recreation Complex and a new workspace called The Garage, which will allow students to work on entrepreneurial projects. McQuinn said the University is also beginning to fundraise for a new biomedical research facility on the Chicago campus. One of Schapiro’s personal goals, to provide need-based financial aid for international students, is also benefiting from the money raised. In its announcement of Elliott’s donation, the University noted up to $20 million of it could be used to challenge other donors to match the money for these scholarships. Schapiro said he wants to raise his $50 million goal for the initiative to $100 million. “If we’re going to move in the direction of admitting the best undergraduates in the world regardless of their citizenship, you’re going to need a tremendous amount of money,” he said. He said the University will spend some money providing these scholarships in the coming year and will market the initiative “very heavily in the next year,” in the hopes of one day making admission to NU need-blind for international students. Currently, the admissions office’s website notes that NU offers limited financial aid to international students, but the admissions rate is less favorable for international applicants requesting aid. Schapiro said convincing donors both in the U.S. and abroad to give money for these scholarships is a “tough sell.” Some foreign donors do not have a culture of giving need-based aid, he said, and some American donors have raised concerns that allowing more international students to attend would jeopardize their own children’s chances of coming to NU.